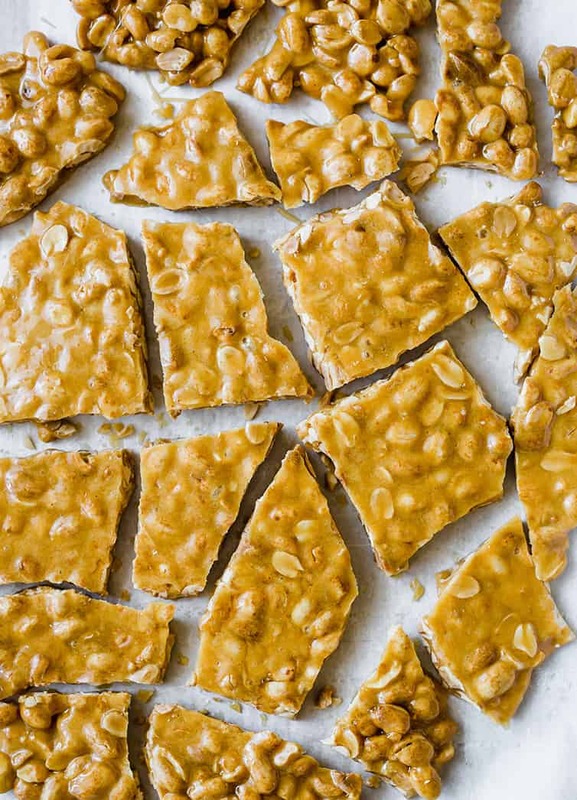 This is a classic, old-fashioned peanut brittle recipe that is both quick and easy – no candy thermometer required. Great for Christmas gifts or adding some pizzazz to those cookie trays! Peanut brittle always fell into the category of “something to buy, not to make” for me. 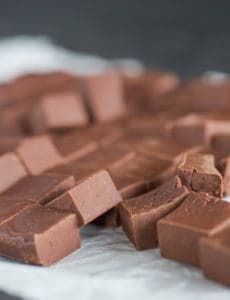 I didn’t grow up in a candy-making family, so tackling things like fudge and brittle was a little daunting to me when I began baking. 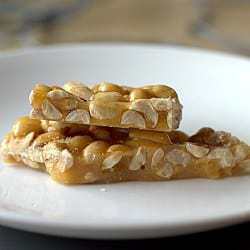 While I always LOVED to eat peanut brittle, it took me quite a long time before I made it myself. After all of that intimidation, I was surprised and relieved to find out how simply it came together, and how utterly DELICIOUS it was! I think the first time I made it I actually had to hide the tin from myself so I wouldn’t eat it all. 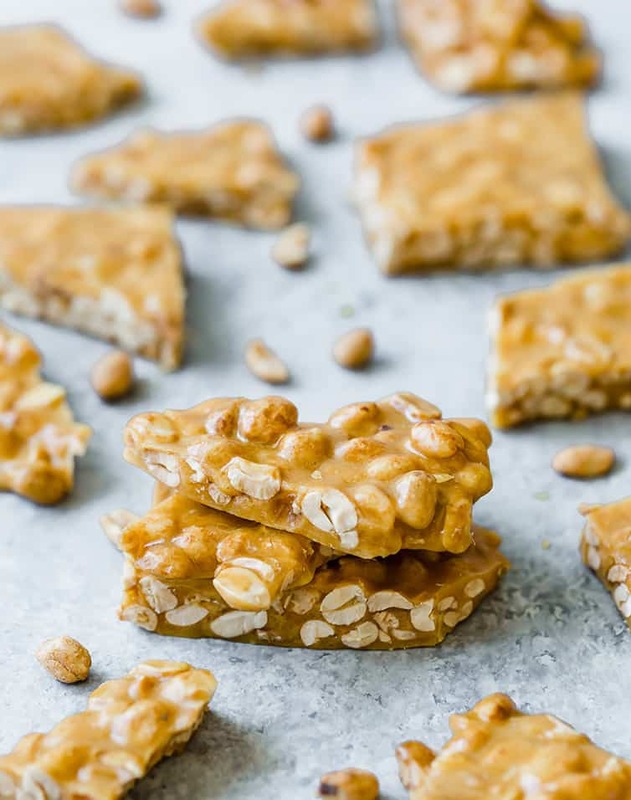 If you’ve been on the fence about making homemade peanut brittle, it’s time to dip that toe in the water and whip up a batch! Make the Caramel – Boil together sugar, water, corn syrup, and salt and cook over medium-high heat until the mixture is a deep golden color; this will take about 20 to 25 minutes. 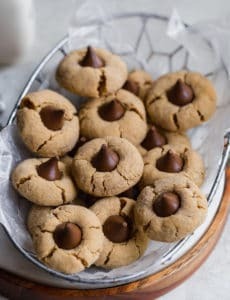 Add Peanuts, Butter & Baking Soda – You will add these all at once and the baking soda will cause the mixture to foam up (that’s what gives brittle all of those teeny tiny bubbles and that glass-shattering consistency). Continue stirring until the mixture is smooth and no longer bubbling, only about another minute. Spread the Brittle – You will need to quickly spread the mixture onto your prepared pan into as thin a layer as possible. It will start to harden very fast, so spread, spread, spread that brittle! 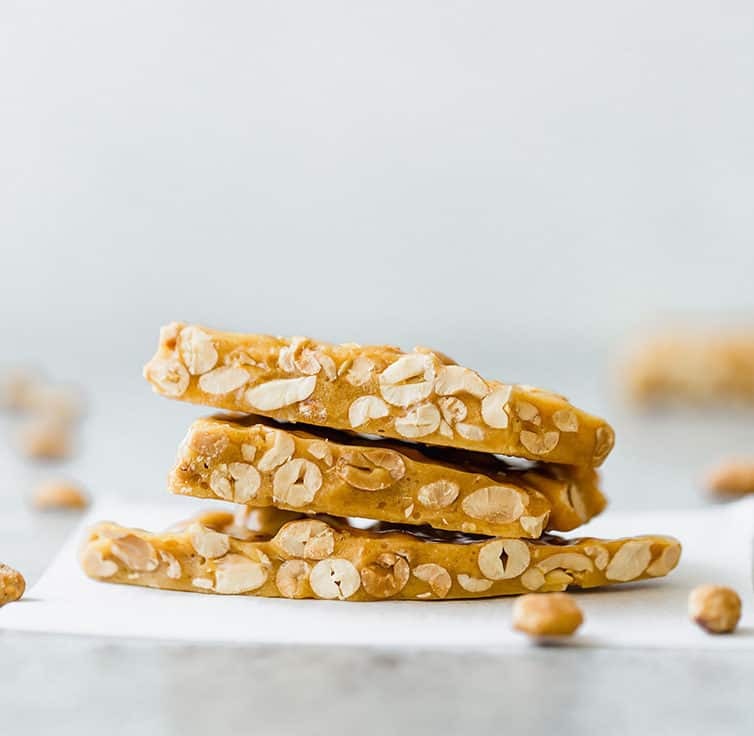 Cool Completely – The brittle will take only about 15 minutes to firm up and cool completely, and at that point you can break it up and store it (or eat it!). A few quick tips for making sure your peanut brittle making goes off without a hitch! Grease EVERYTHING! Before you begin this recipe, make sure that if you’re not using a silicone baking mat (so perfect for candy!) that you spray your parchment paper with non-stick cooking spray, as well as the spatula you are going to use to spread the hot brittle. The hot caramel will be sticky, and having everything greased will allow you to work faster and get the brittle spread into a thin, even layer. 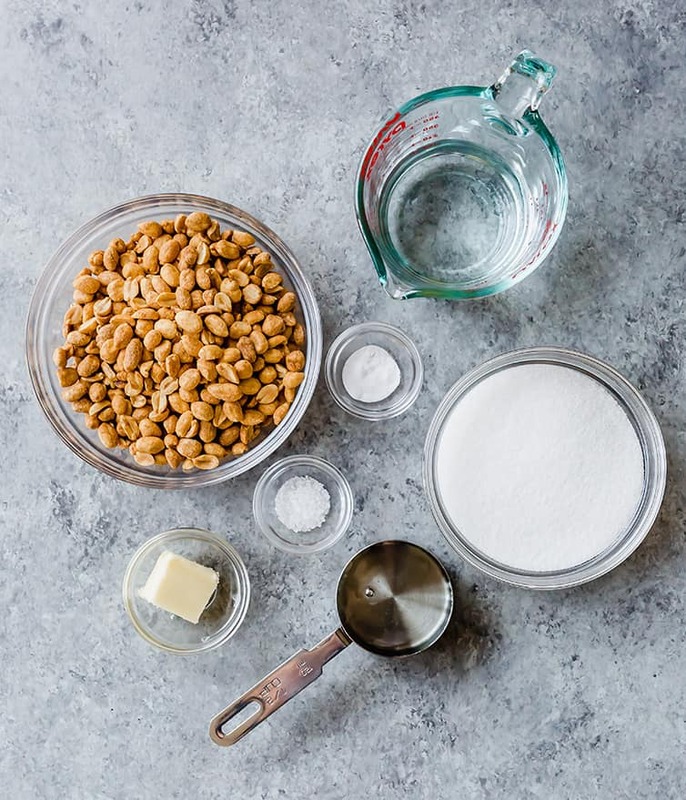 Prep the Ingredients – Have the peanuts, butter, and baking soda measured out and ready to go before you start the caramel. You’ll need to add it all at once as soon as the caramel is ready and you don’t want to have to pause to do any measuring. Work QUICKLY! As soon as it’s ready, you’ll need to pour and spread the brittle onto the prepared pan very quickly. This is key to getting that thin “brittle” consistency; you don’t want to be left with thick brittle! 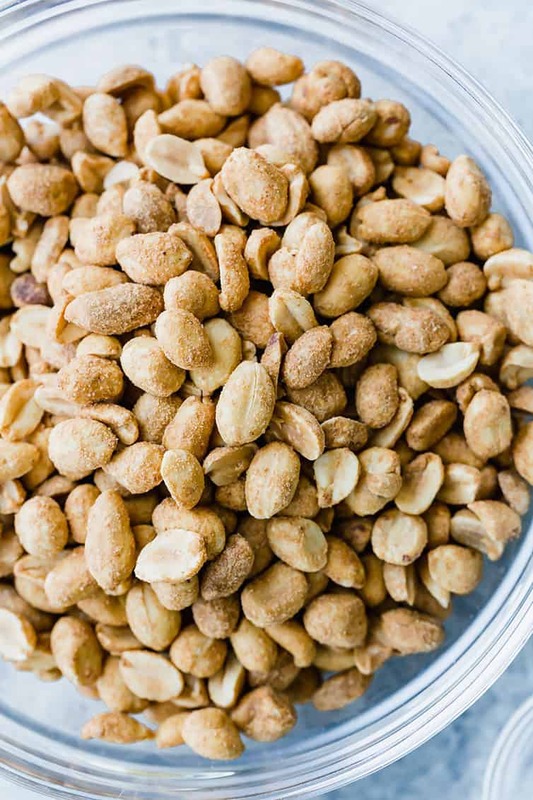 You can use unsalted peanuts, salted peanuts, roasted peanuts, dry roasted peanuts, or raw peanuts in this recipe. Since we are adding the peanuts at the very end off the heat, roasted peanuts will not burn. The texture of this peanut brittle is spot-on to what I have considered awesome peanut brittle in the past. Plus, there are a boat load of peanuts in this batch, which is music to any peanut-lover’s ears. To wrap things up, MAKE THIS! It’s easy, you don’t need any special equipment, and it’s one of the best edible gifts to share for the holidays – it lasts for about a month and stays perfectly at room temperature; no special storage necessary! This is a classic, old-fashioned peanut brittle recipe that is both quick and easy - no candy thermometer required. Great for Christmas gifts or adding some pizzazz to those cookie trays! 1. Line a rimmed baking sheet with a silicone baking mat or parchment paper that has been coated with non-stick cooking spray; set aside. 2. In a medium saucepan, combine sugar, water, corn syrup and salt. Bring to a rapid simmer over medium-high and cook until deep golden, about 20 to 25 minutes. Remove pan from heat. Stir in butter, baking soda, and peanuts (mixture will foam). Stir until mixture is no longer bubbling and caramel is smooth, 1 minute. 3. Transfer to the prepared baking sheet and quickly spread with a lightly greased spatula. Let cool until firm, about 15 minutes. Break into pieces. The brittle can be stored in an airtight container at room temperature for up to 3 weeks. Grease EVERYTHING! Before you begin this recipe, make sure that if you're not using a silicone baking mat (so perfect for candy!) that you spray your parchment paper with non-stick cooking spray, as well as the spatula you are going to use to spread the hot brittle. The hot caramel will be sticky, and having everything greased will allow you to work faster and get the brittle spread into a thin, even layer. Prep the Ingredients - Have the peanuts, butter, and baking soda measured out and ready to go before you start the caramel. 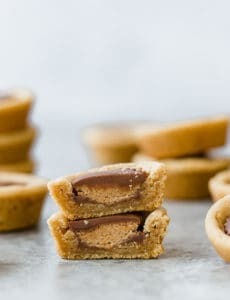 You'll need to add it all at once as soon as the caramel is ready and you don't want to have to pause to do any measuring. Work QUICKLY! As soon as it's ready, you'll need to pour and spread the brittle onto the prepared pan very quickly. This is key to getting that thin "brittle" consistency; you don't want to be left with thick brittle! Nutrition facts based on a 1-ounce serving size. Update Notes: This recipe was originally published in December 2010. Updated in December 2018 with new photos and extensive recipe tips. This recipe is spot on! My first batch was perfect! I made the following adjustments for my second batch – used 1 and 1/2 cups of peanuts and 1 and 1/2 cups of crispy bacon – er meh gawd – so good! I feel kinda dumb asking this, but from the picture it looks like you used the salted dry roasted. Is that correct? I would have thought unsalted just because the salted have seasonings on them as well. I will get whatever you used. This is the best peanut brittle recipe I’ve ever made. I like that it’s not teeth breaking hard. I have made three batches for Christmas gifts. Actually two and a half, since I ate half of the first batch. The other recipe I am using for Christmas gifts is BEB Orange Cookies with Sweet Orange Glaze. This is a real keeper and everyone I’ve made them for can’t believe how delicious they are! Also, as the sugar is cooking, you can lightly brush down the sugar that sticks to the side of the pan with a pastry brush dipped in water. I use a silicon brush so it doesn’t stick. The water will boil off and it will prevent the sugar granules from burning and sticking and not dissolving. I do this when I make caramels too. Makes a huge difference and everything dissolves nicely. Sugar absorbs moisture from the air. If it is humid, the candy will be sticky and may not set up, as you have found. So if your summers are humid, that’s not a good time to make candy. It’s the other way around in Seattle where I am – summer is usually perfect for candy making. Winter is usually not, since the weather is often drizzly. recipe? I’m not a huge fan of peanuts, but I love cashews. Could I use cashews in this recipe? Quick question – do you need to stir the sugar mixture while it is cooking and do you need a candy thermometer at all? I try to make this peanut brittle I don’t know what happened if I put to much of the syrup are what.so what can I do with it now it’s to syruped so what can I do with it???? The one I’m looking for? P.s. as you know many internet recipes aren’t like they are described at all. The recipe sounds as you described, but I have no idea if it’s an exact replica of the canned variety you’re looking for. I hope you’ll give it a try! I still don’t know what “deep golden” looks like, but I rapid simmered for the full 25 minutes on medium-high (6-7 on the dial), and used a candy thermometer anyway, and about the time the timer was about to go off, my thermometer read 300 F! But the color of my mixture was a light gold. I just couldn’t tell from the whiteness of the bubbling.